In 1826 Captain Peter Dillon of the St Patrick was buying timber for masts in the Hauraki Gulf area. A rangatira identified as Tokoroa asked that Dillon take his son and another young rangatira on board. Their real names are not recorded, but Dillon called the two men 'Prince Brian Boru' and 'His Excellency Morgan McMarragh'. The pair were eventually taken to Calcutta, where they attracted considerable public and media attention. 'Prince Brian Boru' wrote the passage above after their 1827 return to New Zealand. 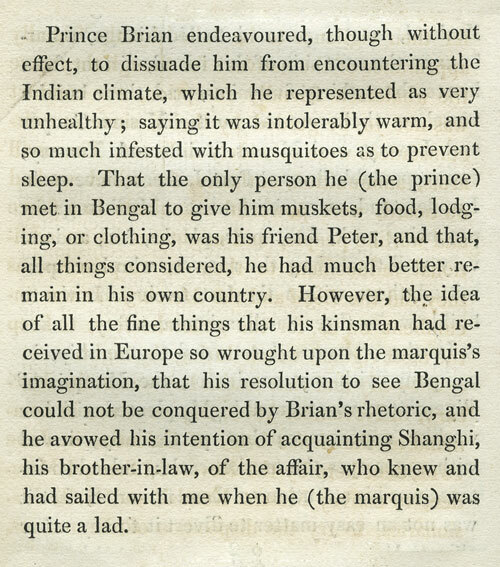 The rangatira Titore of Waimate had expressed a desire to go to Bengal, and Brian, who was not impressed with the Bengali climate, did his best to dissuade him. The text is from Peter Dillon's 1829 book The actual fate of La Pérouse's expedition.